The childhood book that I grew up reading now has a pop-up cafe! 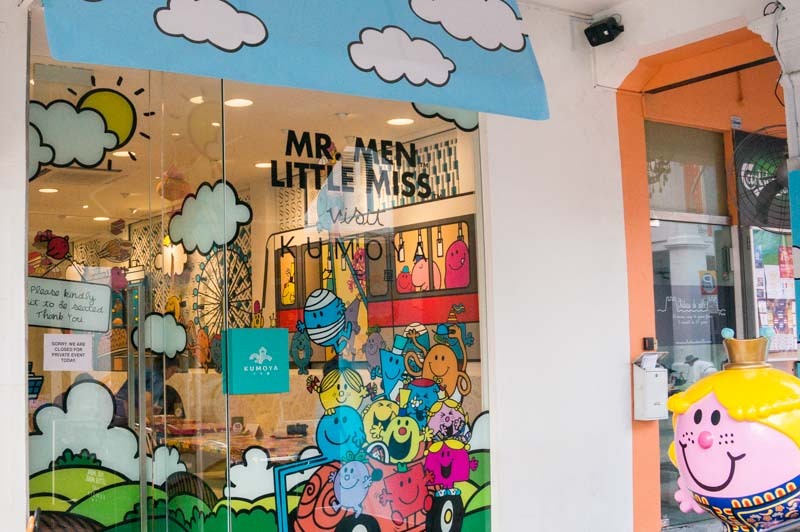 Mr. Men & Little Miss Cafe, situated along Jalan Klapa, joins one of the many pop-up themed cafes that have been sprouting up all over Singapore recently. It will be in operation from 5 July – 30 September 2018 so if you wish to visit, do so soon! As we walked towards the cafe, we were greeted by Little Miss Princess. Dreamed up by Kumoya, the mastermind behind this pop-up cafe, Little Miss Princess is even wearing the iconic Singapore Girl kebaya. As the door swung open, the jingles of Mr Bump’s song resonated around the walls decorated with colourful Mr. Men characters. It’s difficult to not hum to the tune after listening to it over and over again. While the tune was still ringing in our head, we started on the Hand-Cut Fries With House-Made Chilli Crab Sauce ($12.90). I was excited to try out this dish, because I am a big chilli crab fan. However, this did not hit the mark. While the Hand-Cut Fries had a nice crispy crust and a soft interior, the chilli crab sauce was a tad too sweet for my liking, and it overpowered the savoury note of the fries. The shredded crab portion was also pretty modest, compared to the amount of sauce given. We also tried the Mr Strong Chilli Crab Pasta ($21.90). The dish was served with the same chilli crab sauce found with the Hand-Cut Fries. On the plus side, instead of shredded crab meat, we were given an entire soft-shell crab. The dish came with fresh garden salad, tomato confit, keropok, and several star-shaped cheese pieces. Since the same chilli crab sauce was used on the Chilli Crab Pasta, the flavours were a little on the sweet side. But on the other hand, I found it to be rather salty as well. Personally, I am very used to having mildly seasoned food, so your opinion may differ. On the bright side, the soft-shell crab was quite juicy, and the crispy tempura shell gave a satisfying crunch when I bit into it. It was neither too sweet nor salty, which was a huge relief for me. How could I bear to eat an injured Mr Bump? The Mr Bump Knock-Out Nasi Lemak ($23.90) is one of Mr. Men & Little Miss Cafe’s signature dishes, so of course, we had to try it. Using butterfly pea flower coconut rice, while it was indeed fragrant, it was lacking in depth. The rice’s texture was quite flat, instead of being fluffy. My guess is that because the rice has been compressed to form the shape of Mr Bump, it became less fluffy. The tempura prawns were succulent and plump, and were crispy too. I liked that the sweet sambal chilli brought out the flavour of the prawns even more. The crispy chicken was the highlight of the dish. The crispy skin and the tender, juicy centre was the saving grace for the Mr Bump Knock-Out Nasi Lemak. Because the rice was slightly mushy, the crispy chicken helped to give some crunch to the dish. We needed a refreshing drink to quench our thirst, so we decided to try the Butterfly Pea Flower Momo Juice ($10.90). Momo is the Japanese word for ‘peach’, and the combination of butterfly pea flower tea and peach tea resulted in this two-toned drink. In addition, chunks of peaches were added into the drink! We thought that the drink was going to be overly sweet. However, after taking a sip of the Butterfly Pea Flower Momo Juice, the subtle sweetness and fragrant peach flavour thoroughly refreshed our taste buds. I saw a chocolate fondue dessert on the menu, and I knew I simply had to order it. The Mr. Men And Little Miss Special Chocolate Fondue Platter ($23.90) is a dessert platter which should be able to feed two to three diners. The Chocolate Fondue Platter comes with assorted fruits, a cup of double-swirl strawberry Hokkaido soft serve, marshmallows, homemade Milo brownies, biscuits, agar agar ang ku kueh, and of course, the chocolate dip. That’s a lot of sweet treats! In order to preserve its molten consistency, the chocolate is heated with a candle. If you don’t mix the chocolate dip, a layer of charred chocolate will form at the base of the pot. There are two types of sprinkles for you to dip your chocolate-drenched treats into, either the rainbow sprinkles or the chocolate sprinkles. Dipping certainly makes the treats look a lot more Instagram-worthy! The common trend for themed-cafes is to focus on creating a unique dining experience, mainly through gimmicky aesthetics and Instagrammable dishes. While Mr. Men & Little Miss Cafe falls into this category, I wouldn’t entirely discredit the dishes. There were some misses, but I still enjoyed the overall experience. If you’re looking for a place to try out during the weekends, pop by Mr. Men & Little Miss Cafe and be lost in a land of colours!